Thrill your family and friends this holiday season with a metallic photo ornament! Do you have a few family snapshots that you would love sharing with relatives and friends? Create a customized photo metallic ornament using your photos and add a personalized touch to your holiday decor. Your family and guests will admire your photographic treasures every time they look at your Christmas tree. Add interest to your Christmas tree or hang them from an ornament holder to decorate a shelf or side table. No matter how you are decorating your home this holiday, our aluminum photo ornaments will surely add a sentimental and stylish touch. 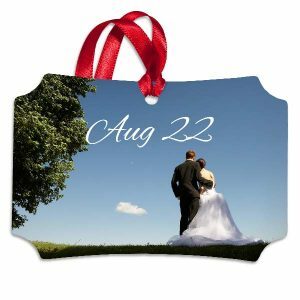 Our Aluminum photo ornaments are available in 3 different styles including fancy square, scalloped corner and fancy rectangle. Each one has a unique silhouette that will add originality to any holiday display, from traditional to modern. With a complimentary red satin ribbon, each ornament can be conveniently hung around the house to jazz up any window, ornament holder or Christmas tree. Made from a durable, high-quality aluminum, they will not only make your photos shine but will last for years to come. Check out our round wood ornament to accent your metal ornaments! You can create metal and wood ornaments of various shapes to give your tree and added touch of style using different materials! Printing on aluminum will bring a luminescent quality to your pictures. With a metallic ornament, your photos will have sharper details, bolder colors and deeper contrast. Your aluminum photo ornaments will allow you to admire your most treasured moments spent with loved ones. Instead of digitally storing your prized images, upload them to MailPix and create a one-of-a-kind ornament. Not only can you personalize your holiday décor with a stylish metallic ornament, but you can share your photo collection with loved ones throughout the season. 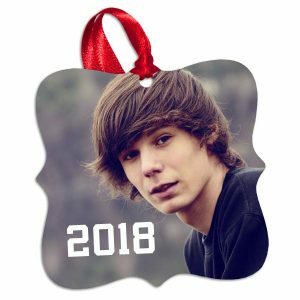 Choose from several ornament sizes and make perfect holiday gift that your family and friends will enjoy for years to come.